Interfacing Technologies Corporation®, a global leading provider of digital transformation, quality management and continuous improvement solutions, is privileged to announce that it has been once again been listed by Gartner® as a leader in Enterprise Business Process Analysis (EBPA). Gartner® is the world’s leading information technology research and advisory firm and this is the fourth straight year that Interfacing’s Enterprise Process Center® (EPC) has received accolades for EBPA and recognition by Gartner as a trailblazing frontrunner within Digital Twin, Business Operation System and Operation Intelligence categories as well. Interfacing Technologies is pleased to announce that it has been recognized by Gartner as a Digital Twin leader. A Digital Twin of an Organization (DTO) is a dynamic software model that organizations rely on for operational understanding of how the organization leverages its business model, connects with its current state, responds to changes, deploys resources, and delivers expected customer value. Interfacing Technologies is proud to announce that its leading product – the Enterprise Process Center® (EPC)has been included in KMWorld’s 2018 list of Trend-Setting Products. KMWorld Trend-Setting Products of 2018 showcase not only emergent software categories such as artificial intelligence (AI), machine learning, cognitive computing and the Internet of Things (IoT), but also more traditional and well-established categories like enterprise content management, collaboration, text analytics, compliance and customer service. Interfacing is proud to be recognized at the 2018 Global Business Insight Awards, receiving the award for Best Management Technological Solutions. This award celebrates business leadership, innovation in finance and investment, and overall global success. Global Business Insight is a knowledge sharing platform that is committed to supplying its audience with the latest business news, financial analyses and developments across the globe. 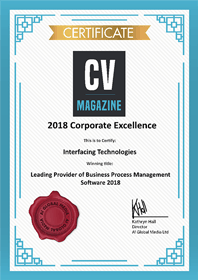 Interfacing Technologies is honored to receive recognition from Corporate Vision as the Leading Provider of Business Process Management Software. Corporate Vision is an online, international business publication that reports and evaluates a range of industries and sectors. The Corporate Excellence Awards were designed to recognize the very best in the business within their specific industry sectors. 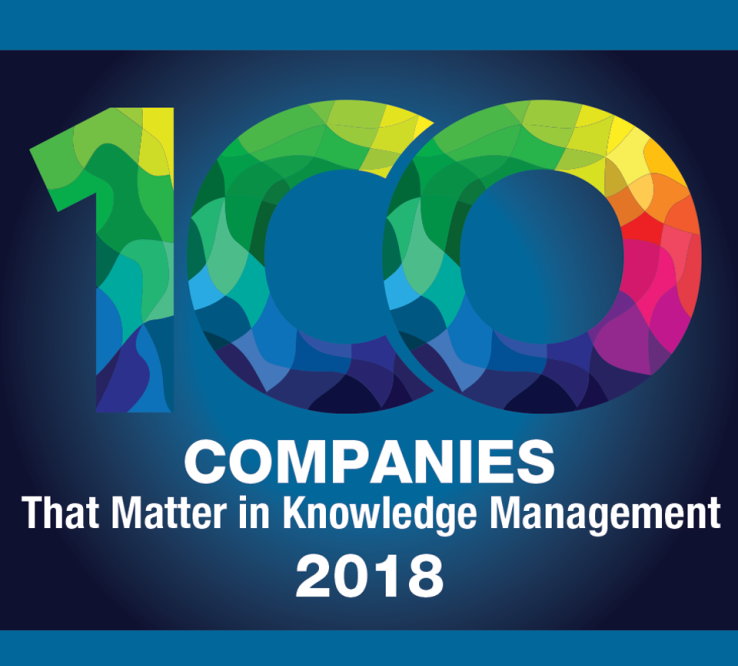 Interfacing is proud to announce that KMWorld has named Enterprise Process Center® (EPC) in its showcase of 100 Companies That Matter in Knowledge Management of 2018. The KMWorld showcase consists of companies that have captured the attention for various reasons including functionality, and success with clients, creativity, and innovation. The recognition from KMWorld reaffirms Interfacing’s dedication to efficiently govern business complexity through process-based management solutions; covering the full spectrum of quality, governance, improvement and compliance initiatives. 2018 – Interfacing Technologies showcased on the cover of Finance Monthly magazine! 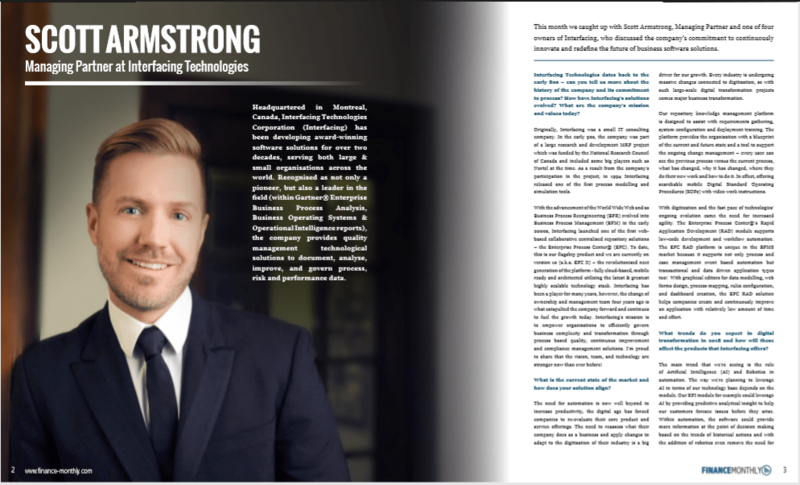 We are extremely proud to announce that Interfacing’s Managing Partner Scott Armstrong has been showcased on the cover of this month’s edition of Finance Monthly magazine! Finance Monthly’s analysts recognized Interfacing’s management software as a GAME CHANGER and conducted a 4 page executive insight article covering the current state of the market, upcoming 2018 trends and how Interfacing’s solutions have evolved over the years. Interfacing Technologies is pleased to announce its recognition by CIOReview as one of the 20 most promising BPM solution providers! CIOReview serves as a leading source of knowledge on rising enterprises and innovative technological trends. Interfacing is proud to announce that KMWorld has named Enterprise Process Center® (EPC) in its showcase of Trend-setting products of 2017. The KMWorld showcase consists of products that check the list for innovation, imagination and evolution. 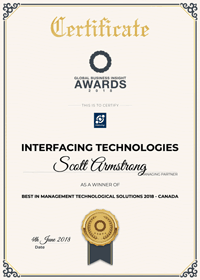 The recognition from KMWorld reaffirms Interfacing’s dedication to innovation and maintaining its position as the continuous improvement solutions leader. 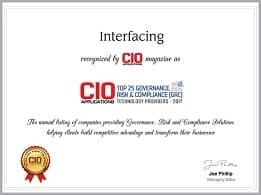 Interfacing is proud to announce that CIO Applications magazine has named the Enterprise Process Center® (EPC) in its list of Top 25 Governance, Risk and Compliance (GRC) solutions for 2017. The CIO Applications editorial team conducted extensive research of GRC technology solution providers world-wide and compiled a list of the leading GRC solutions that align with today’s evolved requirements. Interfacing Technologies Corporation is pleased to announce that for the third straight year the Enterprise Process Center® (EPC) has been recognized as a worldwide leader in Enterprise Business Process Analysis (EBPA) by Gartner®, the world’s leading information technology research and advisory company. Interfacing Technologies Corporation is pleased to announce that it has once again been recognized as a leading provider by Gartner® in the latest Market Guide for Enterprise Business Process Analysis tools. Interfacing Technologies Corporation is pleased to announce that Gartner has ranked Interfacing a leader in Enterprise Business Process Analysis (EBPA) in its latest Market Guide for EBPA, specifically in the Strategy-to-Execution category, and also well positioned in the Process Modeling and Analysis, Enterprise Architecture as well as in the Process Automation categories. Interfacing Technologies Corporation is pleased to announce that it has received a Positive Rating in the Enterprise Business Process Analysis MarketScope recently released by Gartner, the world’s leading information technology research and advisory company. “Positive” was the highest rating awarded to any vendor and this marks Interfacing’s second recognition in a Gartner report within a year; the first being the inclusion in the Operational Intelligence Report earlier in 2013. Interfacing Technologies Corporation is pleased to announce that its award winning business process management software, the Enterprise Process Center® is now included by Gartner® within the list of leading commercial Operational Intelligence Platforms. The San Francisco Public Utilities Commission (SFPUC) implemented an innovative business process management solution to retain baby boomer knowledge and transmit it to the “new” generation of utility workers. 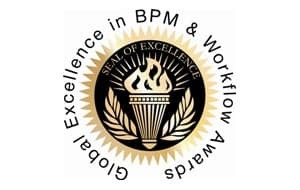 The project’s outstanding results positioned the SFPUC as a finalist for the 2009 Global Awards for Excellence in Business Process Management (BPM) and Workflow; the project will be published in the 2009 edition of BPM Excellence in Practice by Future Strategies Inc. Interested in learning more about Interfacing?